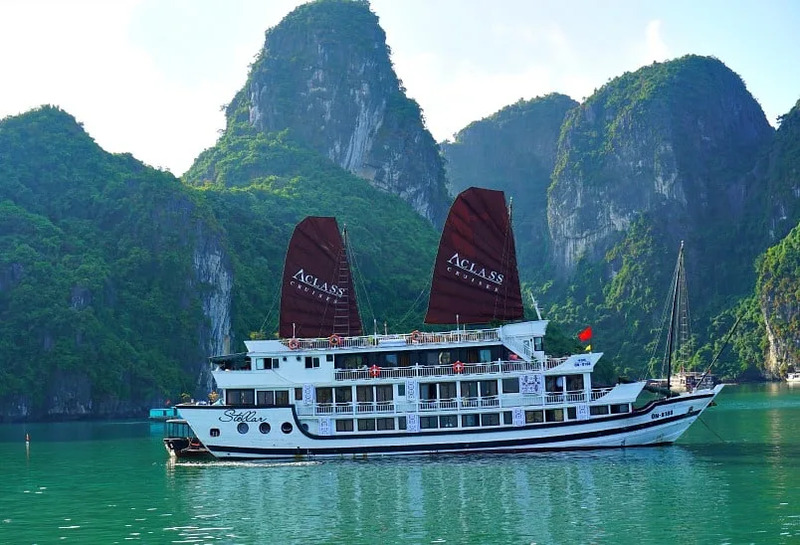 Exploring Halong Bay (or Ha Long Bay, depending on who’s spelling it) by junk boat is an experience that shouldn’t be missed during a visit to Vietnam. How often do you get the chance to float around in an UNESCO world heritage site sipping a glass wine? For me, this was a first. Cruising along in the turquoise blue water among the limestone rock formations in a junk boat is already a lush experience. 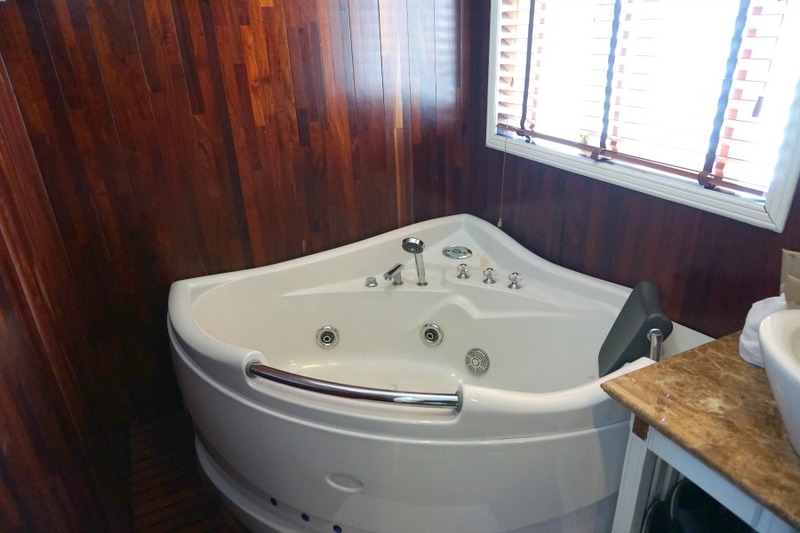 But add in a few perks, like a huge cabin, first-class dining and an attentive and professional staff and your bay cruise is on a whole new level. And as you’d expect in Vietnam, you can get the full treatment without completely breaking the bank. 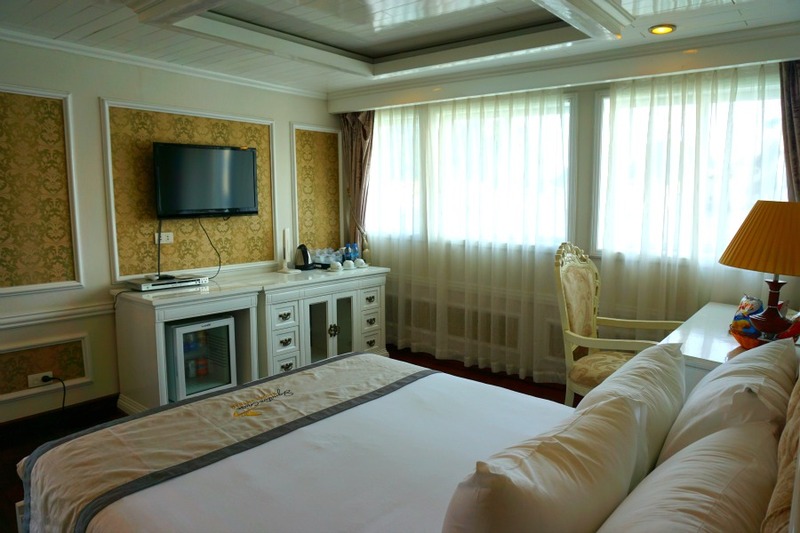 I will confess up front that I was a little worried about being stuffed into a tiny, drippy cabin for our two day Halong Bay tour. My fears were wiped away when I heard those three little words that earn always earn the check-in staff a huge grin, every time. “You’ve been upgraded.” In our case, upgraded to wow! This lovely room with a balcony was actually the second bedroom in the family suite we scored! Main Bedroom with lots of room to spare. The family suite that was our home on board took up the entire back-end of the junk boat. I had read reviews of other boats that were in poor shape and some that even had issues with rat infestations. We were not on one of them and felt that the extra we paid was well worth it. 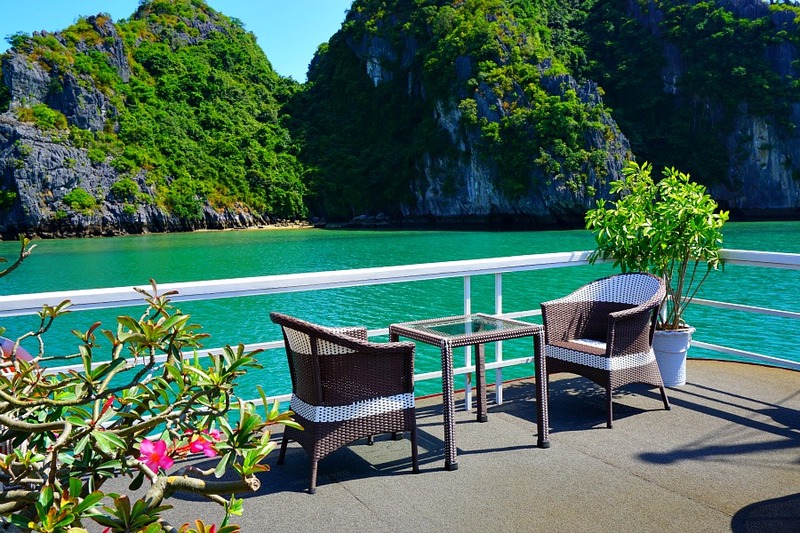 But the real star of the junk boat cruise is really Halong Bay itself. 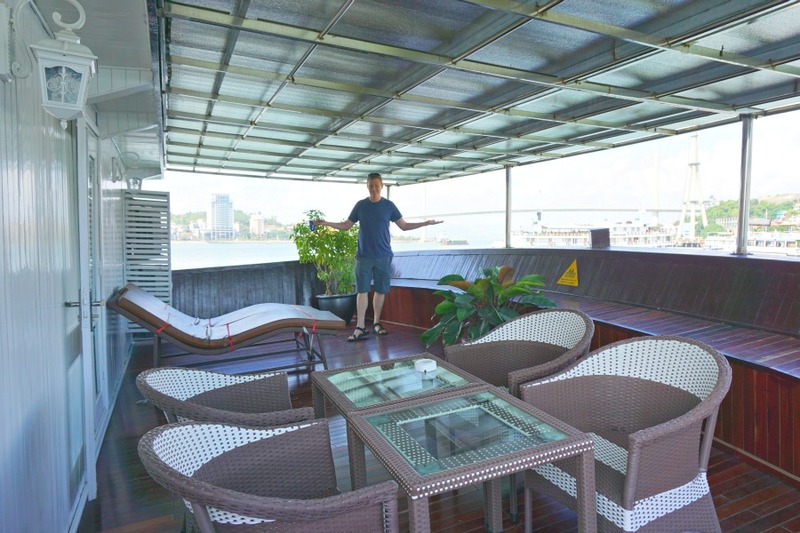 There were several cruise lines with a very similar itinerary to the one we chose. We arrived on the boat, checked into our room, and then had a brief orientation followed by lunch. 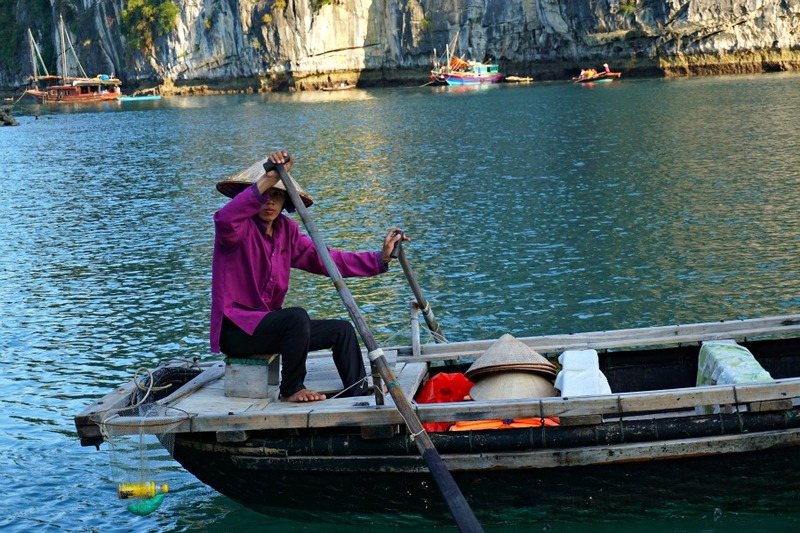 The boat cruised through the bay around the rock formations and ended its first leg near a floating fishing village. There, we loaded up into row boats and get a tour of the floating village and pearl and oyster farm. After the tour, there was time to do a little swimming before getting back on the junk boat and cruising toward the evening Halong Bay mooring spot for the evening. 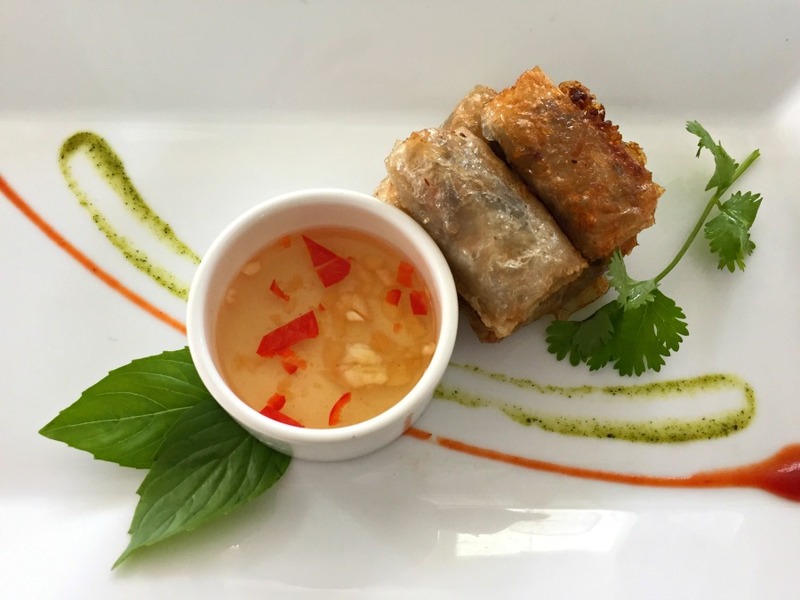 There were activities such as a cooking demonstration and a happy hour before dinner. Tip: on our boat, during the happy hour you could buy drinks at half price. If you purchase more than you drink they are left on your tab to drink anytime. 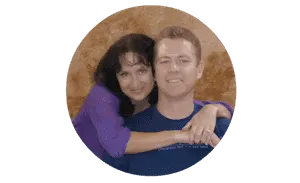 I have to give credit to an Aussie couple we befriended who figured this out – brilliant! And then there was the food…. 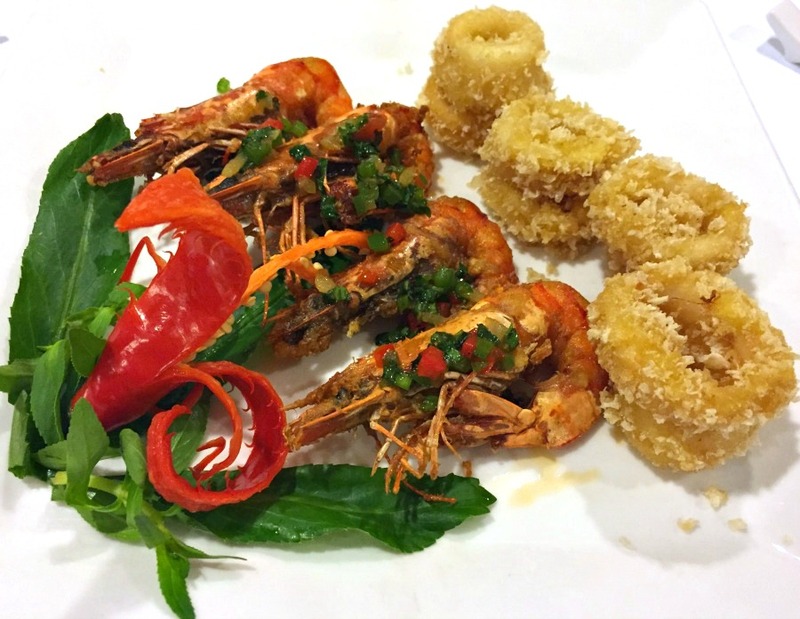 The food during the entire trip was well-prepared Vietnamese dishes with a few additional items, such as an omelet bar available during the huge breakfast buffet. After dinner there were activities such as squid fishing (no, we didn’t have any luck catching squid) or watching a movie from the video library in our room. 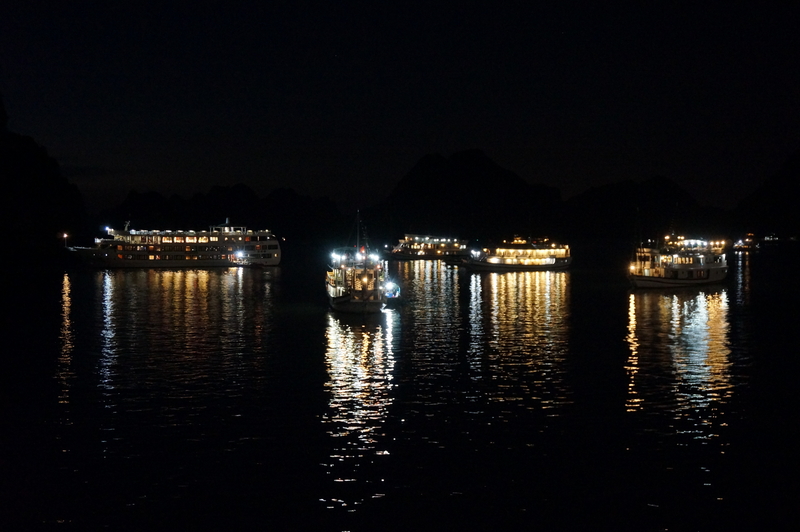 Night on the mooring area of the bay got a little crowded, but seeing all of the boats on the bay is a beautiful sight. The next morning the one day cruisers were taken on a cave tour and then brought back around 10AM for brunch. This is pretty much it for them, and I’d have to admit that if this was my whole experience I would have been a little disappointed. But luckily we splurged a little more and had another day awaiting us. The two day cruisers were ushered onto a smaller boat for a day of kayaking and swimming. On this portion of our trip we were introduced to the boat lady. The boat lady rowed a small boat that was stocked with everything from beer, wine, Pringles potato chips and candy bars all at prices well discounted from what was on offer in the junk boat. 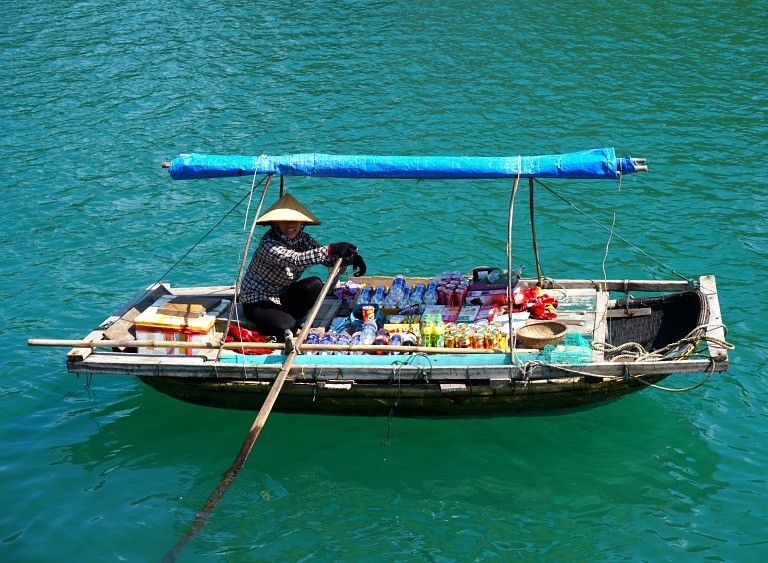 We even learned (from our Aussie friends of course) that she rowed around the larger junk boats at night selling her wares and delivering them to passengers via a net on a long stick, directly to your cabin window. After a day on the water we headed back for a rinse and repeat version of the first night. The following day we had what we consider the most disappointing portion of our trip. Halong Bay Bargain Shoppers Rejoice! 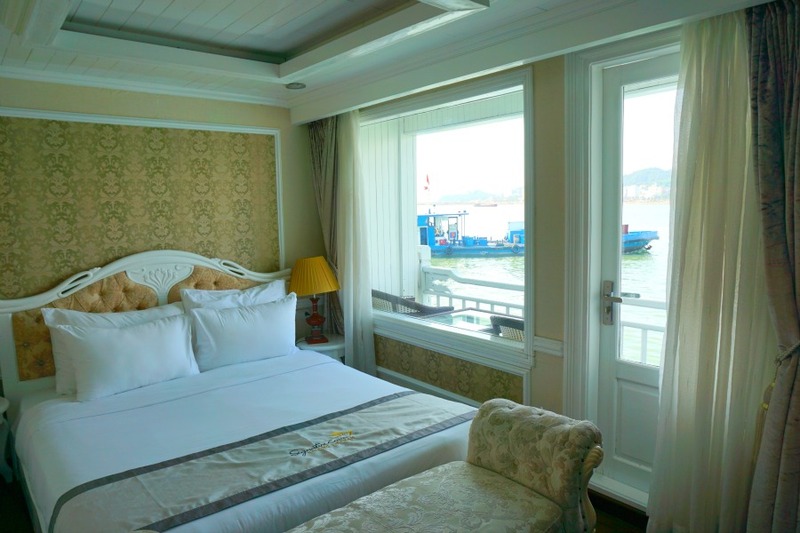 After a small breakfast we were loaded on a small boat and taken to Bo Hon Island, located in the center of Halong Bay. Here were off loaded and given tickets to tour Sung Sot, or Surprise Cave. I’ll admit the cave itself was pretty impressive inside. 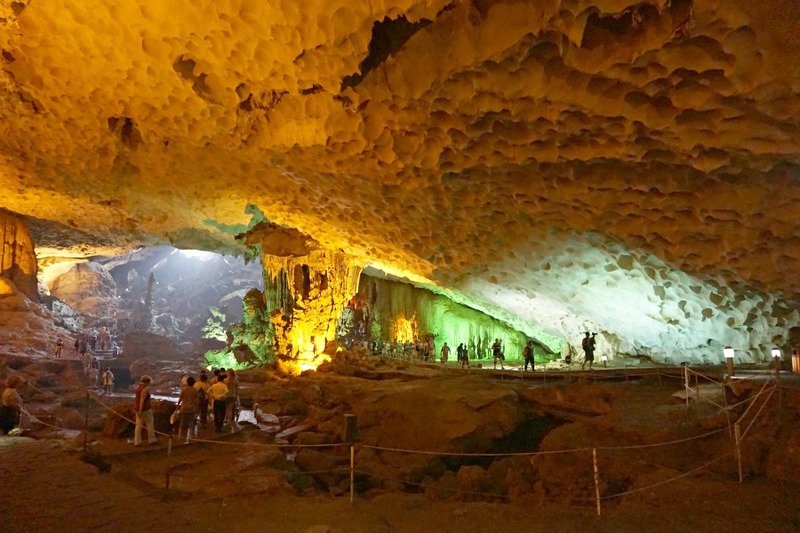 It is the largest and considered one of the most beautiful caves in Halong Bay. What wasn’t spectacular was a huge line of pushy cruisers that we shared an hour with, waiting to get in. We all shuffled along together for another 30 minutes through the cave, before getting loaded back into our respective boats. I honestly could have done without that experience solely due to the crowds. 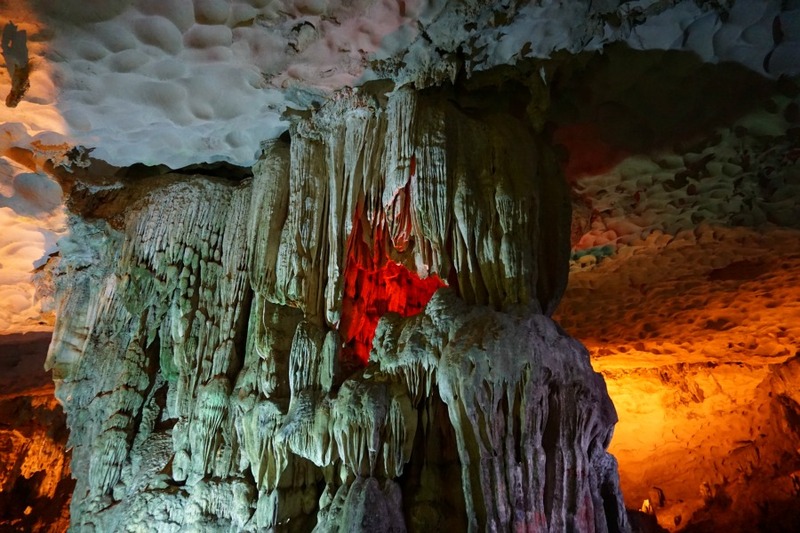 But again, Song Sot Cave itself was pretty amazing. We surveyed a number of other boats during our time on the water. Some were pretty run down, didn’t have any sort of balcony on any of the rooms and had some pretty rowdy passengers. 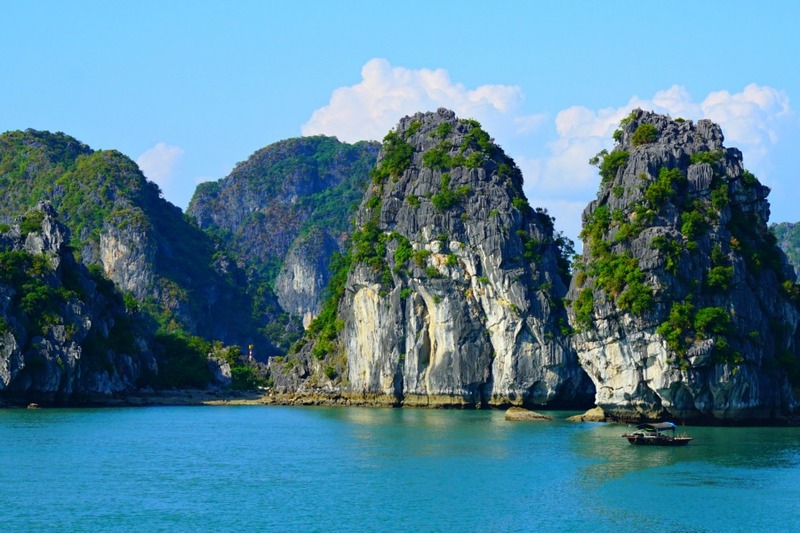 If your goal is to get onto Halong Bay for a bargain and none of those things would bother you, then there are plenty of options. But if you are willing to splurge, you’ll find that getting a truly luxury experience may not be as out of reach as you think. 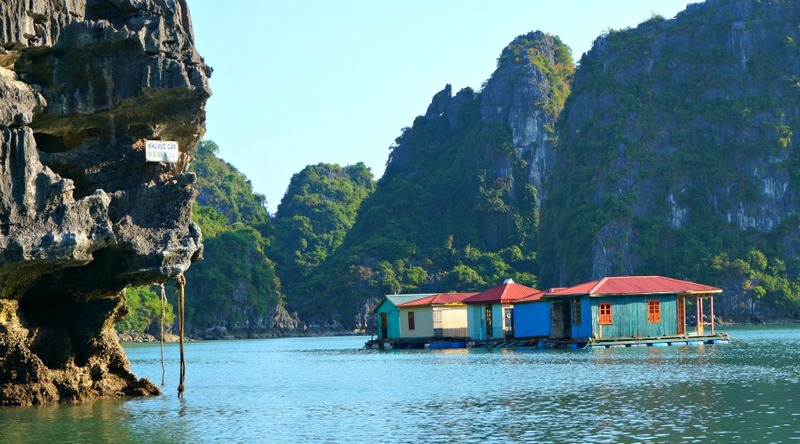 Particularly in budget friendly Vietnam. Here’s a link below to check prices in real-time, and feel free to contact us with questions. We’re happy to help! You guys are so lucky to have been there when it was sunny. It was just completely gloomy when we were there so that dampened the mood a little bit. I loved kayaking though!